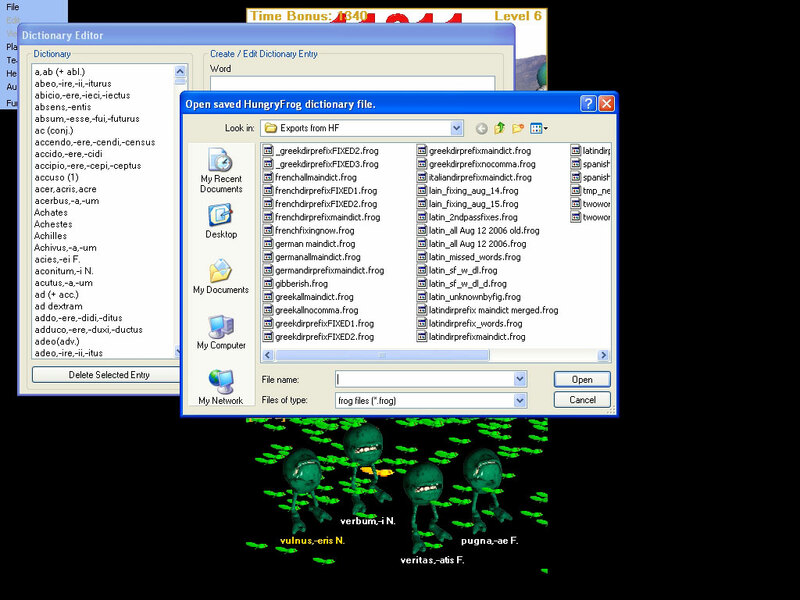 The Teacher Menu Dictionary Manager is where you create and edit dictionaries (most examples are for the latin dictionary), import and export dictionaries to and from disk, and manage sound files which are spoken by frogs. Clicking on the Teacher Menu Dictionary Manager menu item brings up the Dictionary Manager. There are three main group boxes on the Dictionary Manager Screen. 'Dictionary' box - shows the words in the currently open dictionary and the 'Delete' control button. 'Create / Edit Dictionary Item' box - shows the definitions and spoken sound file information for the selected word or new defn. 'File Access' box - shows controls for saving, opeening, merging and restoring dictionaries. 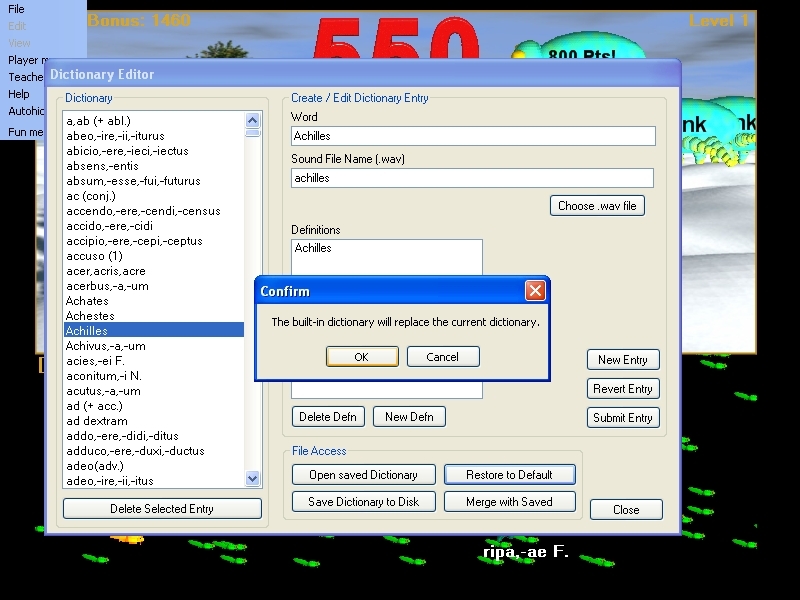 The above screen capture sequence shows the 'Achilles' Latin dictionary word being viewed, a new definition being added to it, the new definition being verified, the new definition being deleted, then restored, then a user defined sound file being selected from the file browser which the game will speak aloud whenever the word is assigned to a frog in the course of game play. This is the simplest group box in the Dictionary manager with just two components. 'Dictionary' word list - this list of words in the dictionary. Clicking on any word in the dictionary expands it's data to fill the 'Create / Edit Dictionary Entry' fields (see Create / Edit Dictionary Entry). 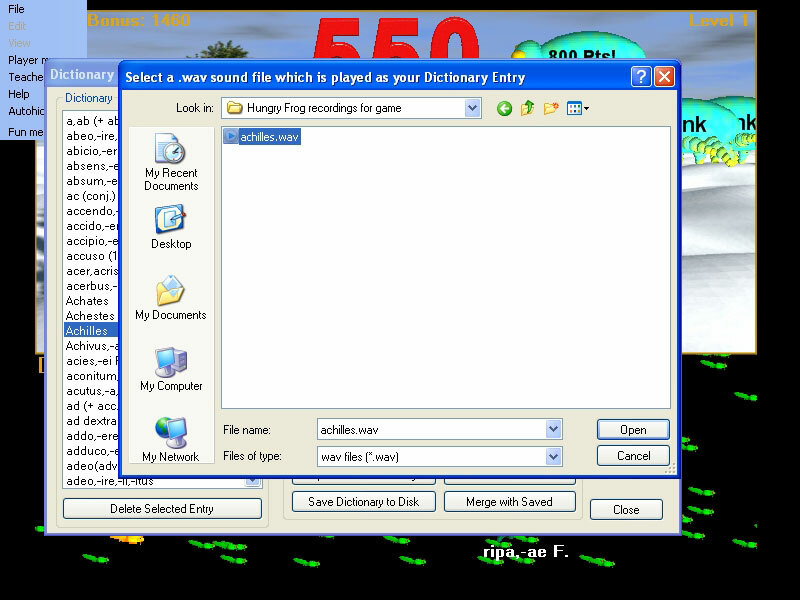 The File Access box has controls to allow you to interact with saved dictionaries on your computer. 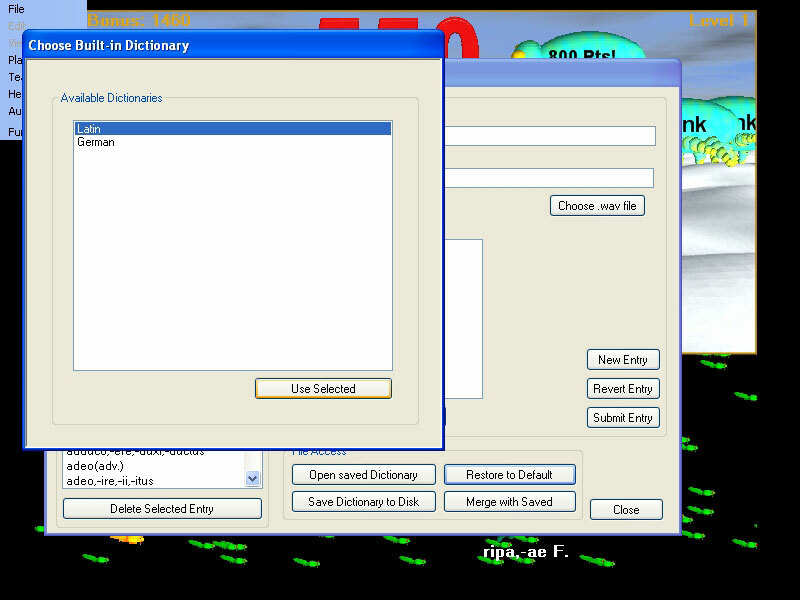 The 'Open saved Dictionary' control button - brings up a file open dialog to open a previously saved '.frog' dictionary file to replace the current dictionary. The 'Save Dictionary to Disk' control button - brings up a file save dialog to save the current dictionary to disk as a '.frog' dictionary file. The 'Merge with Saved' control button - brings up a file open dialog to open and then MERGE a previously saved '.frog' dictionary file with the current dictionary. NOTE: You can merge dictionaries of different languages together, if you want to mix two languages. Just bear in mind that word spellings may overlap, so if you would like to mix languages together in lessons it is much safer to add words from TWO separate language dictionaries into your mixed lessons using the Lesson Manager rather than creating a mixed language dictionary. In short, if you want to practice French and German mixed together, keep your French dictionary and German dictionaries completely separate but create lessons which mix the two languages together. This is the most complicated group of controls. The 'Word' textbox - shows the dictionary word or phrase. The 'Sound File Name (.wav)' - shows the filename of the .wav sound file which will be spoken aloud for the frog of that dictionary entry. The 'Choose .wav file' button - opens a file open dialog to let you select any .wav sound file to be spoken aloud by the frog of that dictioary entry. The 'Definitions' list box - shows the list of current and/or pending definitions for the currently edited dictionary entry. The 'Delete Defn' button - deletes the selected definition from the 'Definitions' box. The 'New Defn' button - opens up the hidden text field 'New Defn' and the corresponding 'OK' button. The 'New Defn' text field pop up - appears when you create a new definition by pressing the 'New Defn' button. The 'OK' button for the 'New Defn' text field - confirms the new definition you are creating. The 'New Entry' button - creates a new blank dictionary entry for you to edit. The 'Revert Entry' button - reverts the dictionary entry you have been editing to the last 'submitted' state. The 'Submit Entry' button - stores the editing changes you have made permanently in the current dictionary. IMPORTANT: The 'Word' can in fact be any word or phrase. It is not limited to just one word. It must fit legibly on a bug, but otherwise it can be any phrase you like. IMPORTANT: When you pick a .wav file to be spoken aloud for a dictionary entry when it becomes a frog, use the 'Choose .wav file' button to select the file. It will then be copied automatically for you into your 'mySounds' folder in your 'HungryFrog' folder in your 'My Documents' folder. You can edit the sound file names directly by typing into the 'Sound File name (.wav)' text box, but if you make an error you may not catch it. There is now a new Latin dictionary definition pending for Achilles. If you click the 'OK' button now, you will add the new definition to the list of Achilles' definitions. Now if you click 'Submit Entry' button, you will save the changes to the Achilles dictionary entry in the opened dictionary. If you decide that Achilles is not that big and strong, then you can click 'Revert Entry' and your changes will be erased and the dictionary entry will revert to the last submitted entry for Achilles (in this case the entry with just his name as his dictionary definition). Now we want to add our own spoken version of his name to replace the game's internal Achilles spoken name as we want to shout it very loud. We click the 'Choose .wav file' button and navigate to our own recording that we saved from our sound editor as a .wav file. We had saved our own file names 'achilles.wav' in our folder of sounds called "Hungry Frog recordings for game' and we navigated to that file using the file open dialog and selected the file (which in this case is the only file in the foler). We click the 'Open' button and the file is played aloud for us so we have a chance to hear it, and it replaces the currently selected .wav file and is automatically copied into our 'mySounds' folder in our 'HungryFrog' folder in our 'My Documents' folder on our computer. Finally, we have decided that we made a lot of changes that were all wrong and we want to just to back to the starting dictionary built into the game itself. We click the 'Restore to Default' button. This brings up a dialog warning us that we will lose any changes we have made to the current working dictionary. If we are worried that we really do like our changes, we should 'Cancel' and 'Save Dictionary to Disk' as a precaution before doing the restore to default command. We are satisfied, and click 'OK' to get to the next step. You are now presented with a choice of built-in dictionaries that are part of the game program itself as back up resources. Depending upon what software you have purchased, you may have more than one from which to choose and/or more than one language from which to choose. In the example, you have a Latin dictionary and a German dictionary available. Select whichever dictionary you want, and it replaces the current dictionary. Make any changes, and save to disk often!